Some might worry about all this rain. They might say something like “Forget this. We’re moving to Seattle.” Because they don’t understand Seattle. But you’re good. You’ve got these things that’ll keep you both dry and attractive until the May flowers happen. Or until it stops raining. 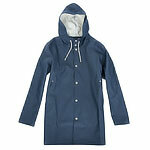 What: A classic rubberized-cotton slicker with a classic rubberized hood. Why: You probably wear the occasional suit. Perhaps a blazer. Maybe just a button-do... okay. Point is, this thing keeps those things dry. And makes you look like a salty old sailor. Minus being salty and old. It’s Okay. This Can Get Really Wet. 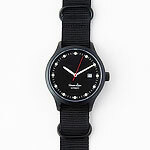 What: A water-resistant, military-inspired watch with a Japanese automatic movement. Why: When caught in a storm, you can use this thing to count the seconds between lightning and thunder to see how far away they are. It also helps you be on time to places. What: A 40-inch spread of waxy oilcloth fabric extending from a maple wood handle. 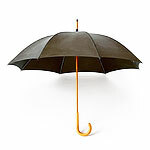 Why: Because when it rains, people look to the one with the umbrella for protection. That was a suggestive approach to making rain seem beneficial. 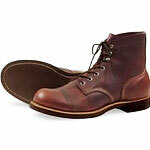 What: Water-resistant cap-toe boots with Goodyear welt construction courtesy of Red Wing. Why: You’re going to need some things that you can wear to work, then out for drinks, then to the regional puddle-splashing competition. Those would be these. Hope to see you at nationals. What: A 10'6" mode of water-bound transportation made of bamboo, glass and foam. Why: It might get really bad out there. Peachtree could flood. People could be stuck inside. Make sure to wave at them from your paddleboard on the way to Waffle House. It’ll be open. Goorin Bros. They’re Here. With Hats.